I came across this infographic on Twitter today. It contains some great quotes about feedback based on articles from the September 2012 edition of Educational Leadership from ASCD. Please click on the link at the end of this blog post to see the full sized PDF version of this infographic. Based on the MOOC I'm doing and various things I'm reading I can relate very much to feedback being informative and not judgmental or evaluative. A couple of years ago at a previous school we were given a book to read over the summer holidays about giving effective feedback to students. It's a shame that a great opportunity was lost to really dig into this book and learn from it, as all we did on our return to school was to spend perhaps 20 minutes or so on the first day of school (staff orientation) in a group discussing one chapter of the book, which was never again followed up. The book itself was thought provoking, and the ideas of what comprises useful feedback are relevant for both adults and students. I'm glad that I'm able to revisit some of these ideas with participants in the MOOC via the various discussion forums. Essentially, I think that giving good feedback enables the person receiving the feedback to be able to come up with his/her own learning goals and a plan of how they will achieve them. In addition, feedback needs to deal with both the performance and also the motivation to do better - those being coached need to know how they can improve and they need to feel they are in control of how they move forward - only then will they be motivated. I think therefore it is especially important to link the feedback of the coach with the teacher's own self-evaluation of his or her performance - they are the ones who can decide how close they are to meeting their goals and what they need to do to make progress. Here is a link to the PDF of the infographic Which of these quotes do you agree with most? 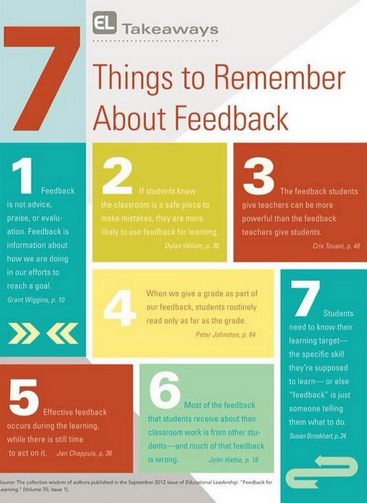 What was the title of the book on feedback? Just interested because it's an area of "assessment" I'm thinking about lately. The book I'm reading now is called Coaching for Performance by John Whitmore. The book we read at a previous school was called How to give Effective Feedback to your Students by Susan M. Brookhart.